Houses & Homes VA: Of all states, this happened in Texas? Of all states, this happened in Texas? While public schools throughout the country have routinely made some very bizarre decisions over the years, I never expected this to happen in such a conservative state as Texas. 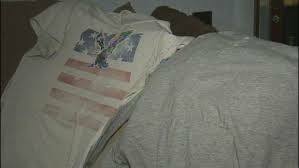 Last week a student at Seagoville High School in Dallas was sent home simply because he was wearing a T-shirt with the American flag on it. Am I the only person that is bothered by this? Apparently an administrator had determined that the shirt violated the school dress code and placed the student on in-school suspension. There was nothing provocative about the shirt; it was nothing more than an American flag design with an eagle around it. It’s worth noting that it was necessary for student Jaegur to pull up the hoodie that he was wearing in order for the administrator to get a good look at it before determining that disciplinary action was required. How silly is that? The dress code at Seagoville High School clearly states that students must wear either a solid color shirt, shirts with a school or college logo or one that is in support of the U.S. military. Wouldn’t you think that the U.S. flag would qualify as being supportive of the military? I certainly would. As it turns out, young Mr. Jaegur is hoping to earn a scholarship through the ROTC program at his school and his mom was worried that a suspension on his permanent school record could affect his chances of obtaining one. The school principal was not present on the day in question but has stated that the administrator had “misinterpreted” the school dress code and apologized to the mother. He also said that the disciplinary action would not become part of Jaegur’s permanent record. That’s all fine and dandy but what concerns me is why this happened in the first place. Do we not have enough serious concerns in our public schools today without administrators asking student to pull up their outer garments to see what is being worn underneath? Shouldn’t we be a little more concerned with other possibilities such as illegal drug use, weapons being brought to school or better yet, ensuring that our young people receive a quality education?